GM engineers want to prevent post-crash Volt battery fires, while some in Congress say news of battery fire investigation was withheld. DETROIT TheStreet) -- General Motors ( GM - Get Report) is working to improve the Volt battery, while Republican legislators are looking to investigate whether the Obama administration withheld news of the battery fire investigation. In other words, it appears, GM wants to fix a problem in the car that it considers the symbol of its future, while Congress wants to make a case against a company that some consider a symbol of the president. The Detroit Free Press, quoting sources, reported Wednesday that the automaker is considering alternatives including reinforcing vulnerable sections of the battery's case. GM is also considering laminating the circuitry inside the battery case and better protecting the cooling system from leaking in a crash, Reuters reported. GM is weeks, not months, away from announcing fixes to the battery, the Free Press sources agreed. Meanwhile, the House Oversight and Government Reform Committee said Tuesday that one of its panels plans a January hearing on whether details of the NHTSA investigation were covered up. "It gives us great concern that recent reports indicate important safety information may have been omitted in testimony before our committee just a few weeks ago," said Rep. Jim Jordan (R-Ohio), chairman of the subcommittee on Regulatory Affairs, Stimulus Oversight and Government Spending, in a prepared statement. "This is a serious situation that our committee will look further into." Transportation Secretary Ray LaHood told reporters on Tuesday that the Volt is safe to drive and denied charges that the government withheld news of the fire in the crash-test vehicle in order to protect GM. Here are recent Volt numbers. In November, GM sold 1,139 Volts. Year-to-date sales total 6,142. Volt inventory is about 4,000 units. 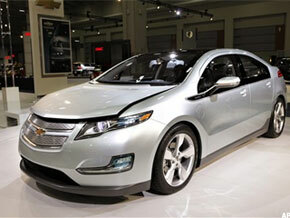 Concern over the NHTSA investigation has prompted a few hundred calls from Volt customers. A few dozen Volt customers have said they will take advantage of GM's offer to lend them, free of charge, another type of GM vehicle and a few dozen more have asked GM to repurchase their cars. -- Written by Ted Reed in Charlotte, N.C.